A special invitation to you, my visitor to join the card-making-newsletter which will be sent to your inbox each month. All the new pages will be listed as well as any new products that I have come across that you could find useful in your own cardmaking. Join the special group of card makers and sign up to receive this free monthly newsletter. Make this your community to share photographs, ideas, tips and techniques. 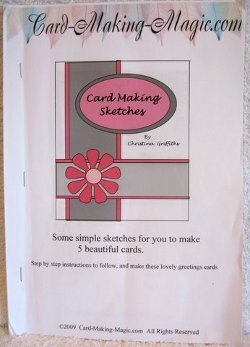 This is the first booklet and it is designed to help you plan out your cards using sketches. This is a new site and the letter will grow as the site does. I will be adding different projects to the website for you to try, and some old and new techniques that may interest you. Subscription?... How much does it cost? Don't worry.... it's FREE just leave you e-mail address to receive it. But have a good look around the site and I hope you enjoy it. There are ideas for your card-making, and some projects for you to try. And much more will be added as I go on, but I am still learning about building a website too, so your patience is appreciated. And your ideas can be added too. There are other forms for specific cards that you can use around the website. The Special Occasions invitation is for those special cards that you may have made, and would like to share, along with your story and your photos at the same time, I'd love to see them. Together we can make these pages grow, to tell everybody the benefits of making your own cards. The fun to be had crafting with family, friends, in a group or by yourself. And the pleasure you feel seeing someone's face when you give your creation to them. So why not add this site to your favourites and be in at the start of this exciting new website.